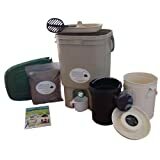 What is Bokashi composting? The best way to compost your food scraps. 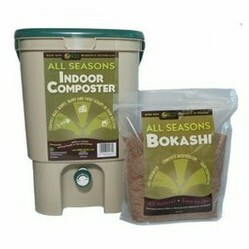 Bokashi composting is an easy way to compost your kitchen waste. The type of waste that you might be sending to landfill right now, could be composted in a bin in your kitchen without any smell or inconvenience. Something like 11% of landfill is from food scraps. As landfill, it will simply produce greenhouse gases and go towards filling up overflowing landfill sites even faster. It was invented by Dr Terua Higa of the University of Okinawa. It uses Effective Microorganisms (EM) which are a combination of yeasts and bacteria. Wheat bran is inoculated with EM plus molasses and is layered in an airtight bin with the food scraps. The waste is altered during a fermentation process that is anaerobic and the smell is like pickled food. A white mould develops which is doing all the work. Any bad smells or signs of black or green mould mean you haven’t added enough bran and you need to throw out the contents and start again. The process does not produce any greenhouse gases and the small scale means it is ideal for those living in a flat. The fermentation takes about two weeks, so it is an advantage to have two bins. One can be filled while the other is fermenting. A Bokashi bucket has a tap at the bottom and you need to drain off any liquid every couple of days. This liquid can be diluted 1:300 with water and fed to your plants. Undiluted, it can be poured down your drains to reduce odours and gunk. Use any juice within 24 hours. After about two weeks you can do a number of things with the scraps. If you add them to a normal compost heap, they will help to speed up the composting. Because they have been treated, they are not attractive to rodents, in fact they actively dislike the smell. Alternatively, dig trenches in your garden and bury it to improve the soil. It is acidic, but will neutralise after about ten days. If you live in a flat, find a friendly gardener who should be happy to bury it in his veg bed to fertilise it. The fermented waste is also perfect to put in a wormery as long as you don’t overfeed them.With the Bokashi method it is possible to compost the waste you would not put straight into a normal composting bin; you can use dairy products, fish (cooked or uncooked), coffee grounds, tea bags , fresh fruit and veg and even some small bones. There are some things you shouldn’t put in your Bokashi bin; wet foods or liquids, shells from seafood and large bones. So why not get composting in your kitchen and reduce landfill.